Photobit was founded by Dr Eric Fossum and associates from NASA s Jet Propulsion Laboratory in 1995 to commercialise the CMOS image sensor technology he had invented there as manager of its image sensor and focal plane R&D programmes. He has over 90 US patents. Photobit used an SBIR contract from the US Army Development Test Command to develop high-resolution, high-speed, low-power image sensors for recording the details of missile launches on test ranges. This initial work led to the development of megapixel Complementary Metal Oxide Semiconductor (CMOS) image sensors with speeds greater than 500 frames per second and electronic shuttering capability that could freeze even the fastest motion to create high quality images. Photobit also used an SBIR award from DARPA to develop a micro-sized, micropower CMOS sensor: its small size and very low power enabled the development of the swallowable pill-camera that is now gaining widespread acceptance for noninvasive medical imaging of the gastrointestinal system. The company also won SBIR contracts from NASA and the Ballistic Missile Defence Organisation (now MDA),and the Navy also used Photobit s technology to build airborne weapon separation monitoring cameras. Though Photobit s early development was largely funded from government contracts, its technology became increasingly used in a range of commercial applications. These included industrial machine vision, high-speed industrial/scientific imaging, biomechanics, and animation systems for motion pictures, television and video games. Cameras using its technology captured various industry awards and were used in films such as The Mummy II and Star Wars Episode II . As the technology improved and manufacturing costs fell, there were also increasing opportunities for volume applications in digital cameras and mobile phones. By 2000 Photobit had annual revenues of $20m, and on the back of the further significant growth potential from consumer applications the company was able to attract a $26m venture capital investment from Intel, Hitachi and Basler A.G. In 2001, Micron Technology Inc, a $4 billion revenue semiconductor company based in Boise, Idaho, acquired the business in an effort to enter this fast growing market. It did not announce the acquisition for 6 months, an indication of the strategic significance of the move to the corporation. By this time it had integrated Photobit's operations and put in place aggressive plans to grow the business, which it renamed Micron Imaging. As Shawn Maloney, Senior Director of Marketing at Micron Imaging put it, "Micron does not enter markets it doesn t plan to dominate." Micron is now the world s leading supplier of CMOS image sensors. Dr Fossum has now moved on to another young,growing high-technology company,Siimpel,which is using MEMS technology to develop a high-quality cost-effective optical solution for camera phones. This work has also been supported by various SBIR and other federal government R&D programmes. Dr Fossum says, "I am a strong advocate of the US SBIR programme as I think there need to be channels other than traditional venture capital to seed new technology businesses. SBIR awards help companies that wouldn t otherwise attract venture capital funding because they have a slow growth profile,or a niche market appeal." "They help entrepreneurs because they allow more self-start and less dilution for the founders of such companies. But they are also very helpful to the government on many levels,seeding businesses that are developing technologies useful to government agencies and,often, to us all. " 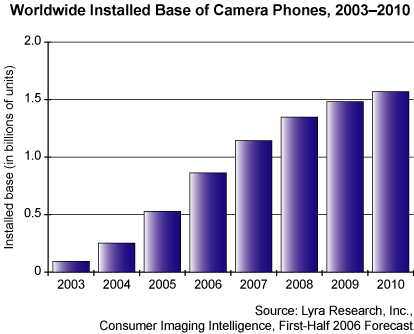 PRWeb: Lyra estimates that the installed base of camera phones will reach approximately 850 million units in 2006, and this number is expected to grow to more than 1.5 billion units in 2010 (see figure). EETimes: Atmel Corp. signed an agreement to sell its Grenoble, France subsidiary and the wafer fab to e2v technologies plc (Chelmsford, U.K.) for approximately $140 million in cash. Most of Grenoble products, including image sensors and aerospace qualified microprocessors, will be part of the sale. Planet82 announced "Color Nano Image Sensor". The high sensitive color nano image sensor is upgrade version of the black and white sensor which had announced in Korea in November 2005. The company completed product development for mass production sensor for surveillance system. This Color Nano Image Sensor allows capturing 30 frames color moving pictures under 0.1lux and is able to shoot 100 frames under regular illumination conditions. In another note Planet82 announces "500 times superior sensitivity specification compare to existing CCD and CMOS with 1/2 size". In yet another note the company announced a 3-year agreement with IBM to use IBM as a foundry to mass produce its sensors. EETimes: Micron revealed a new packaging technology that can be applied to reduce the footprint of both semiconductor devices and image sensors. 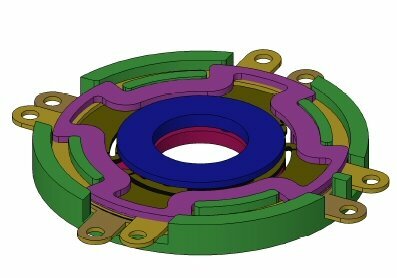 "Osmium" package is still in development but has the potential to half die size by eliminating wire bonds completely. In the through-wafer interconnects (TWI) technique holes are drilled directly through the die bond pad and a conductive material fills them. This provides the shortest route for a connection to the bond of a second die. Using redistributed layer technology allows for pad balls to be redistributed from the die bond to meet standard and custom ball patterns at the edge of the die. Finally the wafer-level encapsulation encloses the die on all six sides while it is still part of the wafer. The packaged parts are mere microns larger than a bare die device at a lower cost, since batch processing die can increase manufacturing efficiency. The side benefit to Micron is that its memory devices and image sensors potentially can be made without leadframes and substrates and reduce the packaging cost, now estimated to comprise 15 to 25 percent of the finished product cost. Yahoo-Finance: Canon launched consumer HDV camcorder with its own CMOS sensor. The 1/2.7" sensor incorporates an RGB primary color filter with Bayer placement. This sensor supplies 1080 HD video to an HDV video tape, while 3.1 megapixel still images. CamcorderInfo.com adds few more details: The sensor resolution is 2.96 gross MP, 2.07 effective MP. The sensor "offers noise reduction built into the chip".